Whether you are a seasoned world traveler or stay closer to home, you will be thrilled you happened upon this week’s FindGift giveaway. Just in time for the holidays, one lucky winner will receive a $100 gift card to Magellan’s, your one-stop-shop for both practical and unique travel gear and accessories. Looking for a way to keep your money secure when you are overseas? Magellan’s offers a wide selection of money belts and cash stashes. Always uncomfortable during those long cross-country flights? Shop a variety of comfort solutions from pillows to foot rests to cushions. Other needs? 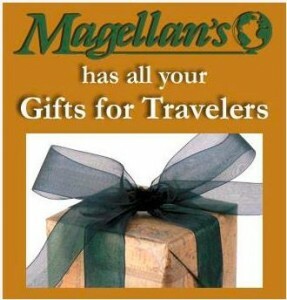 Choose from Magellan’s impressive selection of luggage, international adapters, health & hygiene supplies and clothing. For a chance to win this sensational giveaway, visit the FindGift Facebook page (be sure to “Like” us!) and “Like” the giveaway photo. For extra entries, share the picture on your Facebook wall. The contest ends on Monday, November 18th 2013. Good luck!